We are please to announce our staff for Corsets & Cravats 2019. As many of our instructors interpret multiple time frames, we have added a date under each picture. The date does not reflect on the material they will present at the conference and is simply a description of the photograph. ​Kara has been involved in 1860s living history since 1995 and making reproduction clothing since 1997. She earned a degree in Anthropology from the College of William and Mary where she also took costuming and patterning classes for fun. After several years doing archaeology Kara decided to put her sewing skills to more use and started her business Corner Clothiers, which focuses on civilian men’s clothing during the American Civil War. 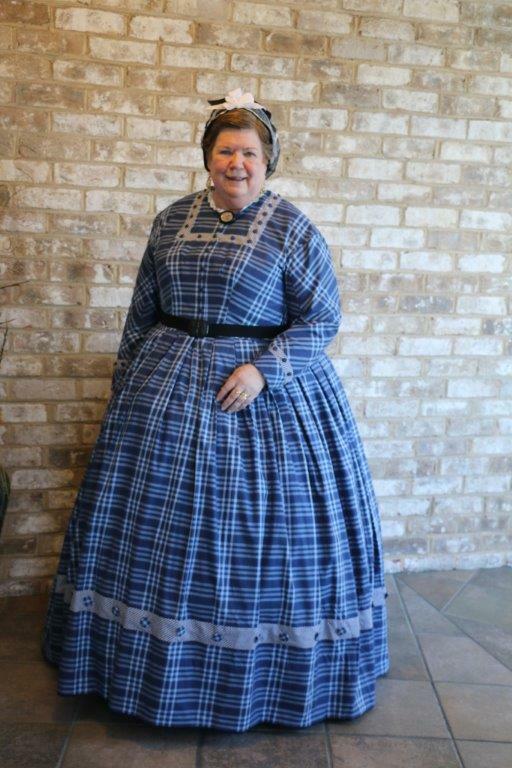 In addition to use by living historians her reproduction clothing and accessories are used at State and National Parks across the country and appear in several productions on television and the big screen. Collecting and researching original garments and photographic images are personal passions as well as key components of her business. Kara was an organizer and one of our featured lecturers in 2018. 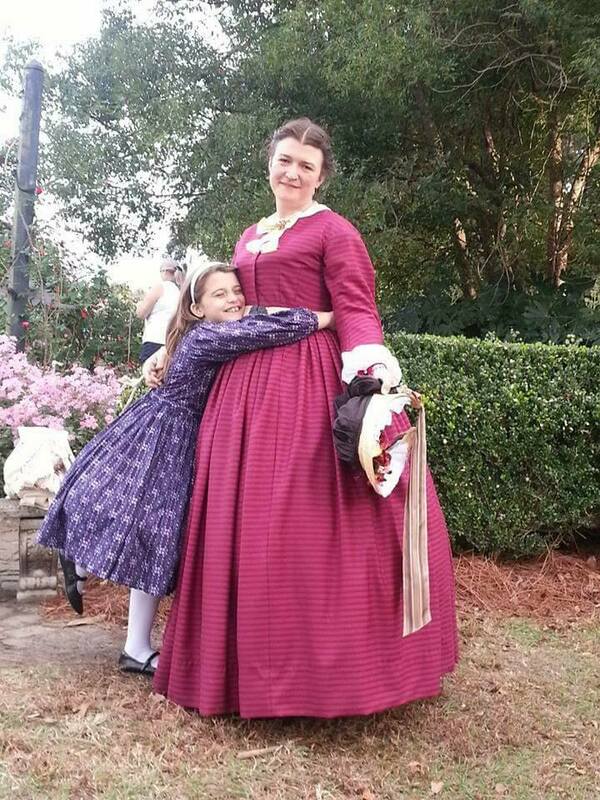 Amanda Brantley has been reenacting for over 12 years. A graduate of UNC-Pembroke, she focuses her research on every day and working-class women in the Southeastern US as well as period cookery and has published articles in the Citizens Companion and the Homefront Herald. She currently serves as the Programs Coordinator for Bentonville Battlefield State Historic Site, North Carolina’s largest Civil War battlefield. She and her husband, John Taylor Brantley, operate Jno. Brantley, Peruke Maker, specializing in 18th Century wigs and historic hair pieces. In her spare time, she authors the blog 19th Century Cookery and sews historic wardrobes for her family. Amanda assisted with the hair dressing class at Corsets & Cravats 2018. Samantha Bullat is currently the tailor for the Jamestown-Yorktown Foundation, where she researches, designs, and constructs garments from the early 17th and late 18th centuries. In 2012, she served a ten week internship with the Margaret Hunter millinery shop learning the arts and mysteries of mantua-making and millinery. She was part of the First Oval Office Project which reproduced by hand the marquis tents of George Washington for the Museum of the American Revolution in Philadelphia, PA. Her reproduction clothing has been featured in exhibits for Mount Vernon and the New York Historical Society. Samantha was one of our featured lecturers in 2018 presenting Shades of Grief which explored 19th century mourning. Late 1850's dress updated for 1861. For years, Rose Marie followed her husband, John, to living history events where he served in various artillery units, both Federal and Confederate. Feeling a bit discontent with just tagging along, and realizing that John would never give up the hobby, she decided to explore the “civilian side”. She was encouraged by the late Betty Loba to attend classes by Carolann Schmitt [Genteel Arts LLC] and, as they say, “the rest is history”. In Feb 2011, Rose Marie retired from the U.S Marine Corps, in the rank of Colonel, after 30 years of service. She and John, also a retired Marine Colonel, live in Newberry SC where they welcome you to “The Town of Friendly Folks”. ​Tyler Grecco is a historian who primarily focuses on the common working people of 19th century America. He works as a historical costumer and advisor for movies, museum projects, and television programs. One of his main areas of study concentrates on how clothing and uniforms can create identity and how that identity is then maintained over time. He believes studying music is immensely important when it comes to understanding the people of the past. Maggie Koenig was born and raised in the Old Northwest. She started sewing shortly after she learned to walk thanks to her very talented mother. 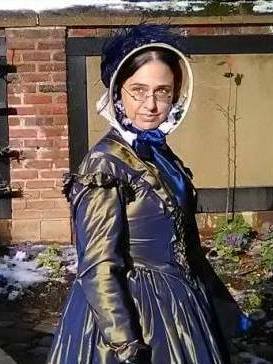 She attended her first reenactment at 14 and began sewing historical clothing. A chance conversation at a living history event led her to the University of Wisconsin-Milwaukee where she graduated in 2008 with a Bachelors of Fine Arts in Costume Production. After graduation she moved to Maryland where she began her career as a freelance dressmaker and pattern maker. Maggie also works as a museum assistant and interpreter at a small historical children’s museum in Frederick Maryland. She is the resident pattern maker for the Genteel Arts Academy, and has been a workshop instructor at the Civilian Symposium at Harrisburg, and has created historic clothing for several museums including the Smithsonian Museum of American History. Maggie currently resides and works in Gettysburg, Pennsylvania with her husband Brian, son Isaac and way too many sewing machines. K Krewer has been a Civil War reenactor since 1981, with occasional forays into earlier time periods. Although she started out as a cavalry trooper, she quickly found that the women’s roles and garments were a lot more interesting. In real life, she’s a civilian Army attorney, serving as Chief Counsel at the Army Materiel Command Legal Center on Rock Island Arsenal, Illinois. She earned a B.A. in political science, history and theatre from Upper Iowa University; a J.D. from the University of Iowa; and a Master’s degree in Strategic Studies from the Army War College. Moving for various Army positions gave her the chance to be a member of the Ladies’ Soldiers’ Friend Society of Nashville, the Michigan Soldiers’ Aid Society, and the 16th Iowa Veteran Volunteer Infantry. A collector of garments and accessories from 1840 -1865, items from her collection have been displayed at conferences, seminars, history-related events, and museums. K is an ordained Anglican deacon and is active in congregational, professional, musical, and community service activities. She and husband Tom Flaig, a firearms instructor and retired cowboy, enjoy a rural retreat where they care for two horses, a dog, twenty-something chickens, and a few cats, and are still talking about what they want to do if they grow up. Ann has been reenacting from the time she was born in 1975. Her father, Jack Marlar, established one of the first artillery units in SC, and traveling to events was a frequent occurrence from toddlerhood thru the teen years. Her childhood vacations regularly involved trips to battlefields across the US and touring War-era homes. Needless to say, she was destined for a life in the hobby. Attending seminars, workshops, lectures enriched the experience and led to a growing desire to be the best representation of the 1860's woman she could be. Ann met her husband, Brad Maddox, at a reenactment dance near Charleston at Boone Hall. (Naturally, he was also an artilleryman.) They now reenact together and their 2 daughters join in the fun occasionally. In 2015 Ann worked to establish the Greenville Ladies Aid Association, a ladies reenacting group which is modeled from the records of the original organization during the time of the Civil War. She also enjoys collecting fans, CDV's of fans being held by their owners, and original hoods. ​Ann looks forward to welcoming everyone to the Palmetto State, where you'll find "Smiling Faces, Beautiful Places". Ann was on the Corsets & Cravats planning committee. Brian Merrick grew up next to a Quaker meeting house which inspired a life long love of history. Reenacting since 1990, Brian worked as an extra on several films such as Gettysburg, and Andersonville. This experience lead to the leading role in the independent film Wicked Spring. Being involved in film work lead to an interest in practical special effects. Since 2005, he has worked on special effects for History Channel, Discovery, Disney, Warner Brothers, Warm Springs, and Cortina Productions. His dedication to accurate historic reproductions inspired him to learn to sew and do leather work. He began doing leather work in 1995 and in 2004, started Merrick’s Custom Leather. He makes reproduction military and civilian goods based on original artifacts and photographs. Brian started the 1850’s Camping Society with Tyler Grecco in 2015. The group initially started in an effort to recreate Courier and Ives and Bingham paintings and grew from there. They are currently in the process of building a period boat. Dannielle Perry, historic milliner and author, began participating in Living History in 1995. After spending many years carefully creating her own impressions, her interests turned to millinery and in 2006 she opened Timely Tresses with partner Mandy Foster opened. To fuel her research, Dannielle is an avid collector with over 200 extant bonnets, over 200 antique photographs of women wearing bonnets, and over 1000 fashion books and engravings. A graduate of North Carolina State and former teacher, Dannielle is author of Fashionable Bonnets: from the Introduction of the Ambrotype in 1854 through the End of the American Civil War in 1865, Finishing and Straw Bonnet Form, and Drawn Bonnets: Examination and Construction. She is the managing partner of Timely Tresses. Timely Tresses is a premier source for museum quality reproduction bonnets and millinery supply. Dannielle was an organizer and lecturer at Corsets & Cravats 2018. For more information, visit www.timelytresses.com. Jeannie made her first hooped gown in 1969 at age 6, using a real sewing machine, wire hangers and an old curtain. Through the years her sewing skills have improved and she has made hundreds of costumes for pageants, parades, plays, operas and period events. Twenty five years of historical time travel include; The Revolutionary War, War Between the States, WWII and Pirates of the Carolinas. A collector of Mid-19th century clothing and accessories for 40 years, she owns and extensive collection. She is a retired Delta Flight Attendant, attended Jet Mechanic School, holds sky diving certification, private pilot, scuba dives, runs in marathons, performed in Musical Theater, traveled to 28 countries, studied ballet, harp and Italian Opera. She has held many Pageant titles. This year marks the 30th anniversary of her volunteer work with Miss America. 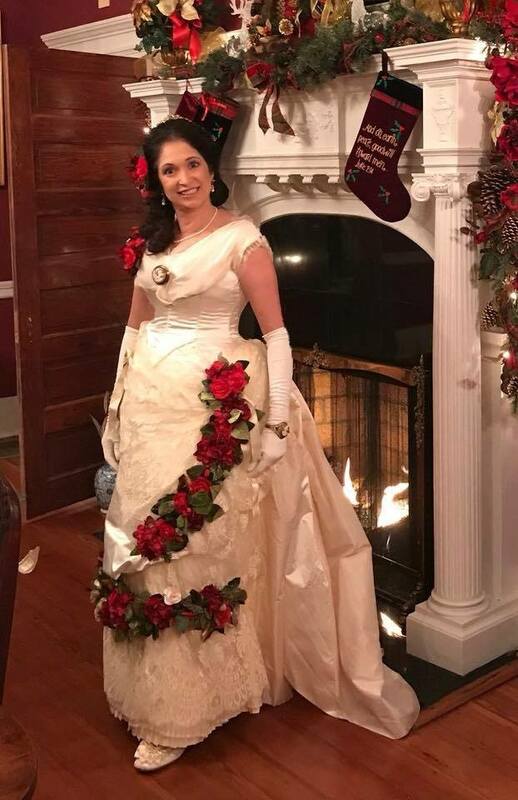 With her husband, Chris, a retired head and neck surgeon, they have hosted a Civil War Era Ball, "The Firing on Ft. Sumter Ball" held every April in Spartanburg, SC since 2002. They live in Spartanburg with their two Persian cats, a Tortie Point named Nelly Bly and fancy retired Show Cat Princess Winnie Davis. Jeannie was an organizer and the hospitality coordinator for Corsets & Cravats 2018. Interpreting late 1863 to early 1864. Carolann Schmitt founded the Genteel Arts Academy in 1988 to encourage interest in mid-nineteenth century clothing and needlework. The Academy offers a continuing series of hands-on classes on 100+ topics, with classes held across the country. Carolann was the sponsor and organizer of the Civilian Symposium/Ladies & Gentlemen of the 1860s Conference from 2000 through 2018. She is busy planning new opportunities for education and research for future years. She is a popular speaker at conferences and seminars across the country. 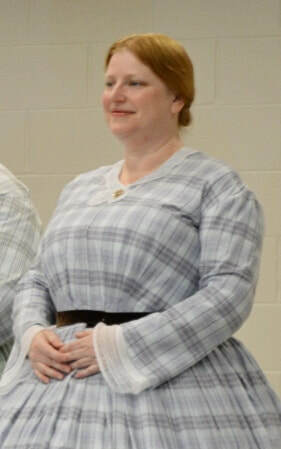 Carolann is a member of the Costume Society of America, the Association of Living History Farm and Agricultural Museums (ALHFAM), and several sewing and needlework organizations. She believes you can never have too many books or too much fabric. Studying mid-nineteenth century clothing has been her passion since she attended her first reenactment in 1969. Carolann was a featured lecturer and instructor at Corset & Cravats 2018. Ernest Shealy was born and raised in Newberry. He received his BA in Fine Arts from the College of Charleston in 1985. In 1987 he received an MA in Architectural History and a Certificate in Historic Preservation from the University of Virginia. He has worked with The Charleston Museum and its historic houses. In 1996 he returned to Newberry to direct the Newberry Visitors Center until 2003. Since then he has been self-employed and has worked with the Road Scholar (formerly Elderhostel) program at the Isle of Palms. Currently, he is curator of the Newberry Museum. Ernest has been active in community, preservation and museum concerns for many years. He served on the board of the Lake Murray Country Visitors Center for six years and has been chairman of the Newberry County Accommodations Tax Commission since 2000. He also has served on the State Review Board for the National Register of Historic Places. Ernest was one of the founders of the Newberry County Museum Association and continues to serve as the museum curator. He also serves on the board of the Newberry County Historical & Museum Society. Phillip Whiteman is a native of Atlanta, Georgia. He has a history degree from the University of Alabama and has been involved with living history for 24 years. Along with 19th-Century men's clothing, his primary interests are financial and political aspects of the Civil War. Phillip is currently digitalizing and cataloging historical documents for the Kennesaw Mountain NBP library. In 2017 Phillip started teaching Senior Adult Education Classes on the Civil War. 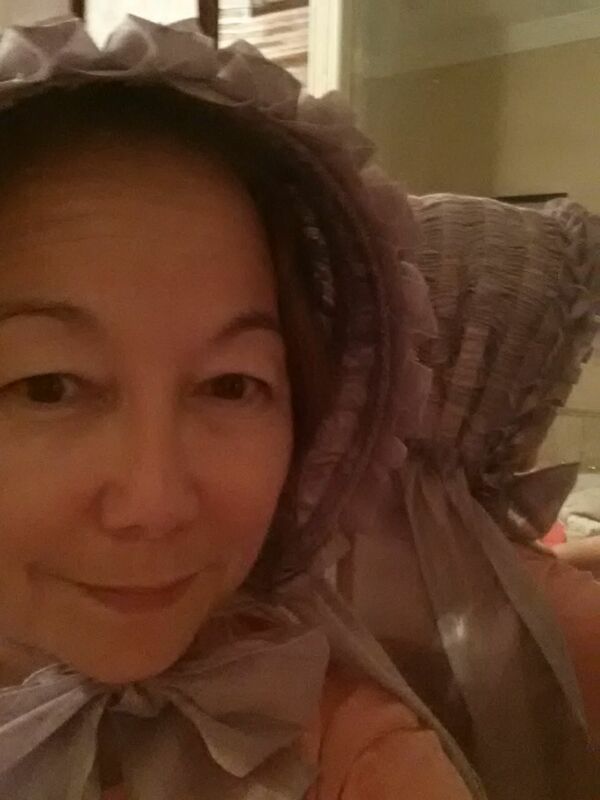 Janine Whiteman has been researching clothing and accessories of the Civil War era for 24 years. Along with her husband Phillip, they began collecting originals and started the PNJW Collections in 1997. These collections of Civil War era artifacts include men's, women's and children's clothing, shoes, hats, accessories, and other civilian artifacts. These collections are used to create a traveling exhibit, which is periodically set up at historic sites and National Parks. Phillip and Janine have provided educational presentations at Civil War reenactments, National and Regional conferences, historical society and civic group meetings and local schools.